Please review the class scheduling information below and see our tips for selecting objects as well as ideas and inspiration from other faculty. We ask that all visits to the Art Museum and Skinner Museum be scheduled through a staff member, and we invite you to arrange an initial planning meeting to discuss your ideas for a new class experience or assignment. Collaboration is key! The better we understand your teaching objectives and specific course content, the more helpful we can be in structuring your museum visit. To better serve you and to give us time to make all necessary preparations, we ask that you contact us at least 2-4 weeks in advance to arrange your museum visit. Due to high demand, we reserve our Teaching Spaces—the gallery spaces and our classroom, the Carson Teaching Gallery—on a first-come, first-served basis. The classroom is often booked a semester in advance, especially for classes visiting multiple times throughout the semester and for popular afternoon seminar times. 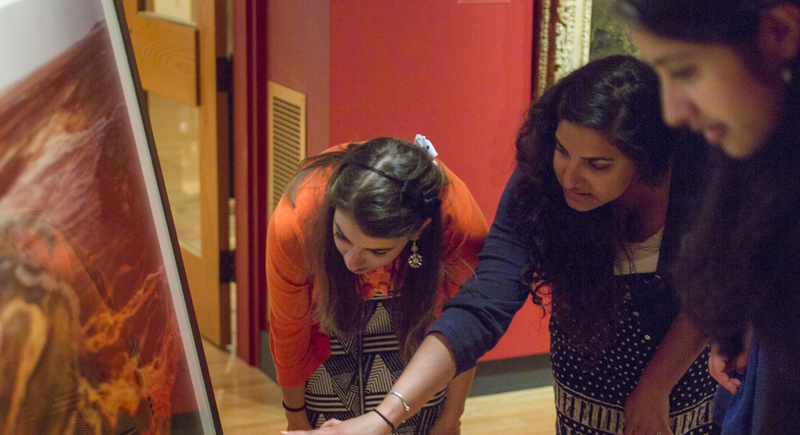 With advanced scheduling, faculty, students, and classes may visit the Skinner Museum any time throughout the year. Please review the Museum Guidelines in advance of your visit. We ask that no food, drink, large bags, or pens be brought into the Museum. We provide pencils should your students need them. We also suggest that you share these guidelines with your students in advance of your visit. The pdf can be uploaded to your Moodle class management site or sent directly to students prior to their Museum visit.